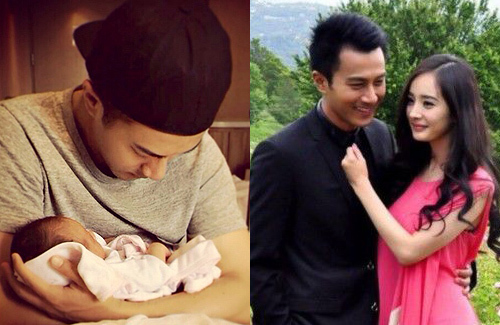 This year’s Father’s Day was extra special for Hawick Lau (劉愷威), as it was his first time spending the holiday as a father. Yesterday at 9 a.m., Yang Mi (楊冪) uploaded a photo of their newborn baby girl, nicknamed “Little Sticky Rice”, being held in Hawick’s arms. Although Hawick was in Hengdian filming for a new drama and was unable to stay with his newborn daughter in Hong Kong, he expressed his love via Weibo. At 12 p.m., he forwarded his wife’s post and thanked her for bringing their daughter into his world. “Rice Rice, Daddy misses you,” he added. The couple’s sweet messages quickly garnered over 20,000 comments. Netizens sent the happy family their congratulations and blessings. Besides Hawick, his father Lau Dan (劉丹) has also been busy with work. Speaking of receiving gifts on Father’s Day, he revealed that Yang Mi had bought a cake to celebrate. “My daughter-in-law did give a gift! But having a family enjoy dinner together is already a very good gift.” Lau Dan added it was very exciting to watch his granddaughter eat food, since it made himself feel happy and full as well. Awww, that’s a precious pic of daddy holding his newborn daughter! Wow! an artistic Picture of daddy and daughter posing but I don’t they can win a contest with this unusual posing….he..he..anyway congrats them with a bundle of joy !